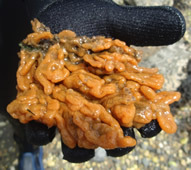 The invasive ascidian Didemnum vexillum has recently spread into south shore bays of Long Island, New York, including Great South Bay and Shinnecock Bay. D. vexillum feeds by filtering plankton from the water. To investigate the impact that this species will have on plankton, clearance rates, the volume of water swept clear of food per hour, were measured both in the laboratory and the field. Oxygen consumption and growth rate were also measured. Clearance rates from both laboratory and field experiment were always low, suggesting that D. vexillum did not feed during the experiments. This was likely due to the disturbance caused by handling the animals. Using oxygen consumption, growth, and literature values for ammonia excretion and absorption efficiency, it was also possible to estimate the clearance rate needed to support growth. This estimate ranged between 0.32 and 0.77 liters per gram of tunicate per hour, much higher than the measured clearance rate and comparable to other ascidians. Lab and field observations suggested that D. vexillum is sensitive to low salinity and high summer temperatures. 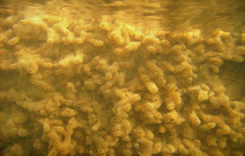 These environmental factors may limit the impact of this invasive tunicate in the south shore bays.